his broadband service is likely to offer 100GB data at 100mbps speed in the initial phase as part of its preview offer. The company is currently conducting test runs of JioFiber service 10 major cities. 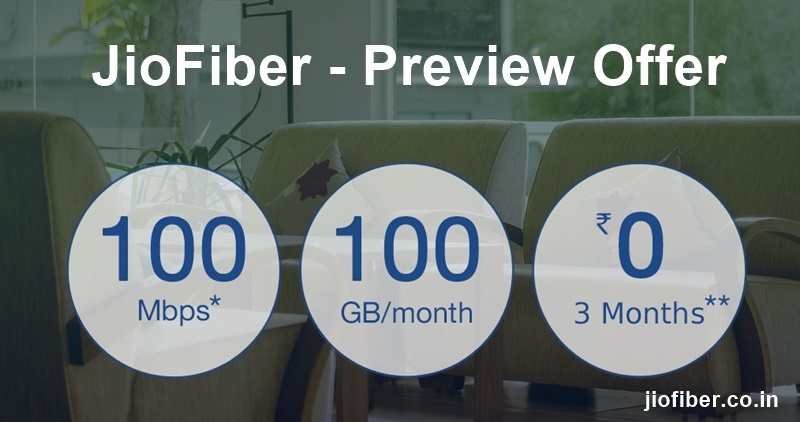 According to a 2017 report by Business Standard, the telco is expected to launch high-speed fibre to the home broadband in more than 30 cities early 2018. Telecom operator Reliance Jio is expected to launch its own Fiber to the Home (FTTH)- JioFiber broadbandservice by the end of March this year, according to a report by TelecomTalk. Previously the company was expected to launch the service by end of 2017 and now there is report suggesting that the company might launch the service by the end of this quarter. The telco accidentally revealed its tariff plans for its FTTH service in July last year which suggested that it would give three months of 100GB internet at 100mbps speed under its Preview offer. There is speculation based on some reports that one may have to pay Rs 4500 initially as installation fee which will be refunded later. Reliance Jio announced its commercial operations in September 2016, since then it has been coming up with offers, one after another. The telco received flak and got into legal trouble for the continuation of its offers, however, amidst all this the Jio users made the most of its free services. Jio has now come up with its latest ‘Dhan Dhana Dhan’offer but here’s a look at all the Jio offers since the time of its launch.